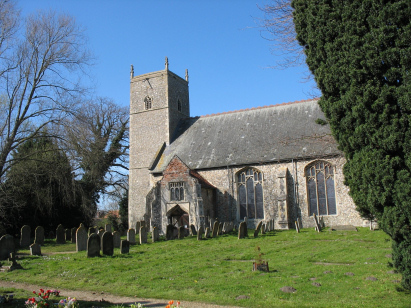 The parish of Lyng sits in central Norfolk north-west of Norwich by about 12 miles and just south of the A1067 which links Norwich with the market town of Fakenham. Lyng is a riverside settlement, adjacent to the River Wensum a pleasant clear stream with delightful weirs and mills. The village centre is south of the river on slightly raised land above the flood levels. It has a compact centre with most village amenities still present although these days it does serve as a commuter village to the city of Norwich. St Margaret's church lies at the eastern end of the village and is set back behind houses and accessed by a narrow lane. 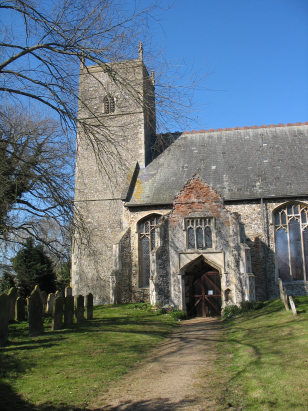 Like most churches in Norfolk the design is largely Perpendicular and from the 14th century. However, also typical of the region, much was changed during Victorian times and latter, the chancel for example dates to just prior to the First World War. Two register books, both standard 800-entry registers, cover the period of the transcript and beyond. Both books are filmed on Microfilm MF 587 in the collection of the Norfolk Record Office and from which this transcript was prepared. The film is quite elderly but the registers must be in fine condition as most entries are clear and legible. As a result this was a straightforward transcript to prepare and it is to be hoped few errors will have crept into its construction.